Removing stains in and around the home just got easier with the new and improved OxiClean Versatile Stain Remover. The new formulation works better in the wash, when used as a pretreater and is more advanced in fighting grass, grease and dirt stains than the original formulation. 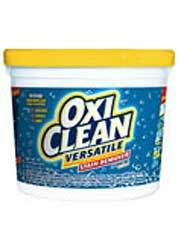 BOOKMARK THIS PAGE Oxiclean Versatile Stain Remover 6 lb.